What if Your Laptop is Missing Parts or Accessories? We get calls and emails all the time asking if you can sell a laptop for parts or if it must be a newer and fully functioning model. Luckily there is still use for models that might not be 100% complete how you originally bought them. Small accessories like a missing charger or broken DVD drive only slightly lower the value of a computer. With our instant quote process you can deduct just the items you're missing and still get an accurate quote that will reflect exactly what it is worth. 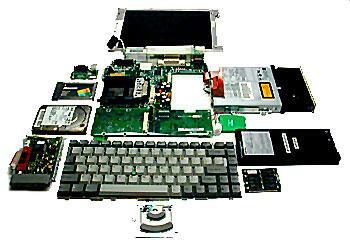 Say you have a bunch of laptops from your business or a school and they ended up having a lot of the parts broken or lost. Chargers are the most common but they can be replaced quickly and easily so it doesn't lower the value of your quote by too much. Batteries and hard drives would be next as those items are always the next to fail. A hard drive has spinning disk and is the one moving part in your machine so it's no surprise these are the most likely part to fail even on new ones. A battery will only last for so long as well and the manufactures knew this going into making them, it's why replacing your battery is super easy and can typically be done without tools until the newer models. They are however expensive especially to get the original one that is of a much higher quality than an aftermarket replacement brand. If any of these items have failed or stopped working as well as they should it might be time to look into getting it repaired. It is very dependent on the model however, sometimes a laptop is just not worth fixing especially since they're not all made equally. If you bought a top of the line gaming machine that had the latest and greatest hardware it would most likely be worth spending a couple hundred dollars to keep your $2,000 system from being thrown away. If you bought the $250 Black Friday special that uses a 10 year old Intel Celeron processor and can barely stream Netflix or Pandora it is likely not worth spending $100-150 to get it back into working condition. Getting a quote for repair parts can be expensive in itself so these are all things to take into consideration when you're trying to decide what is best for you. We HIGHLY recommend not going to a larger store like Best Buy or Staples because they're going to charge you a fee for everything and anything. Just for looking at your computer and telling you it's a bad hard drive (something you already knew) they're going to charge you $80! So find out if you really like the computer first and is it worth fixing or your other option, go to a place that will recycle your laptop for parts and actually pay you for it even if it's not in working condition. Doesn't get much better than getting paid money for broken electronic items!